react-testing-library builds on top of dom-testing-library by adding APIs for working with React components. You want to write maintainable tests for your React components. As a part of this goal, you want your tests to avoid including implementation details of your components and rather focus on making your tests give you the confidence for which they are intended. As part of this, you want your testbase to be maintainable in the long run so refactors of your components (changes to implementation but not functionality) don't break your tests and slow you and your team down. So rather than dealing with instances of rendered react components, your tests will work with actual DOM nodes. The utilities this library provides facilitate querying the DOM in the same way the user would. Finding for elements by their label text (just like a user would), finding links and buttons from their text (like a user would). It also exposes a recommended way to find elements by a data-testid as an "escape hatch" for elements where the text content and label do not make sense or is not practical. This library is a replacement for Enzyme. While you can follow these guidelines using Enzyme itself, enforcing this is harder because of all the extra utilities that Enzyme provides (utilities which facilitate testing implementation details). Read more about this in the FAQ. NOTE: This library is built on top of dom-testing-library which is where most of the logic behind the queries is. 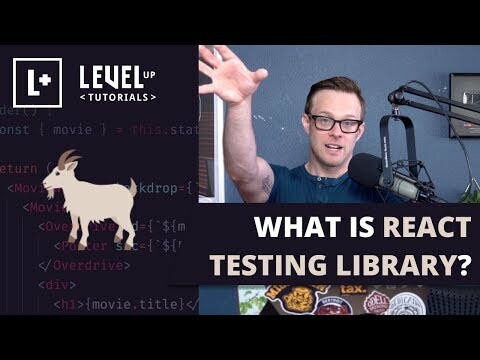 Have a look at the "What is React Testing library?" video below for an introduction to the library.